Today in Masonic History Darryl Francis Zanuck is born in 1902. 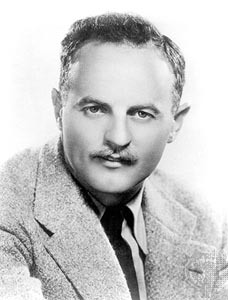 Darryl Francis Zanuck was an American writer, film producer and studio executive. Zanuck was born in Wahoo, Nebraska on September 5th, 1902. He would live in Wahoo until the age of 6, where his parents ran a hotel. At the age of 6, he moved with his mother to Los Angeles hoping that the better climate would help her health. At the age of 8, Zanuck would enter the movie world for the first time as an extra in a film. His disapproving father ordered him back to Wahoo immediately. At the age of 16, Zanuck tricked an Army recruiter into letting him enlist. He would serve in France with the Nebraska National Guard. When Zanuck returned to the United States he worked in various jobs. He also began writing and tried to sell movie plots. He would not be successful until 1922 when he sold his first movie plot. After that he began working for Mack "King of Comedy" Sennett at his studio. He took that experience and got a job with Warner Brothers where he wrote stories for Rin Tin Tin, as well as over forty other scripts under various pseudonyms from 1924 to 1929. In 1927, Zanuck was involved in producing the film Ham and Eggs at the Front, a film that he would later regret being involved in. In 1929 he moved into management with Warner Brothers and in 1931 he became head of production. In 1933, Zanuck left Warner Brothers because of a salary dispute with studio head Jack L. Warner. Just a few days later, with financing from Nicolas Schneck and Louis B. Mayer, and along with 3 others Zanuck formed 20th Century Pictures, Inc. 20th Century released their movies through United Artists, a relationship that came to a quick end in 1935 over a dispute regarding stock ownership. During those first two years, 20th Century was highly profitable, 18 of their 19 films broke box office records for profitability. Zanuck spent much of his career making up for his involvement in the making of Ham and Eggs at the Front. The film, as it is put in one modern review, was made in a time that was "less racially conscious." The film made with an all white cast was done in black-face. The story itself was involved two bungling doughboys, one named Ham and the other Eggs, who manage to get themselves tangled up with a local French girl who is a German spy. The French girl was played by Myrna Loy, who later called her appearance in the film shameful. It was Ham and Eggs at the Front that inspired Zanuck to take a much more activist role with his movie making, before many others in Hollywood would take up the call. Zanuck would make such films as Pinky, a movie about racism in the American south, The Grapes of Wrath and Tobacco Road, two films that took on poverty, Gentlemen's Agreement, which took on antisemitism, How Green Was My Valley, which took on unionization and the environment and The Snake Pit, which addressed mental illness. The Snake Pit compelled 13 states to change their laws regarding mental health after the film was released. Zanuck was a heavy cigar smoker. He passed away from jaw cancer on December 22nd, 1979. Zanuck was a member of Mount Olive Lodge No. 506 in California.